READING To Kill a Mockingbird by Harper Lee. Again. Not sure whether I should read the next one too. Any thoughts? Where did my Literacy come from? MAKING a knitted cowl for Lucy. 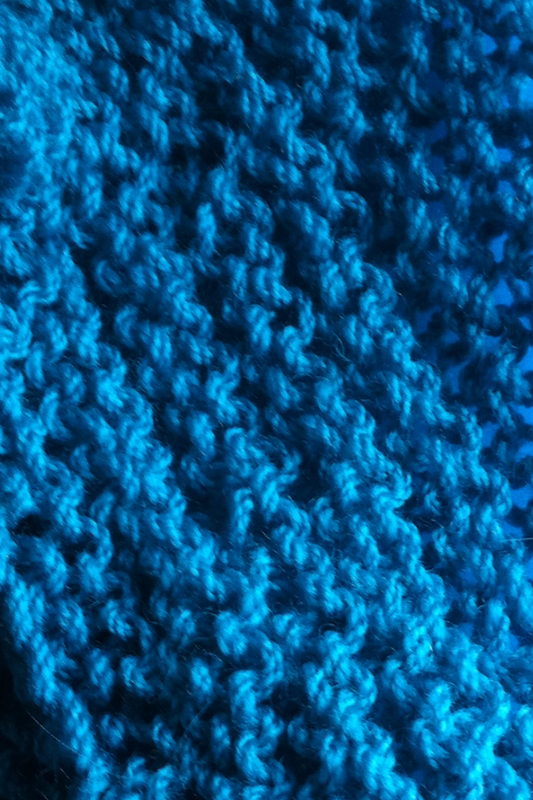 Cowls are what I make when I knit. VISITING Sydney Olympic Park on a school excursion. WATCHING Grand Designs Abroad with my kids. 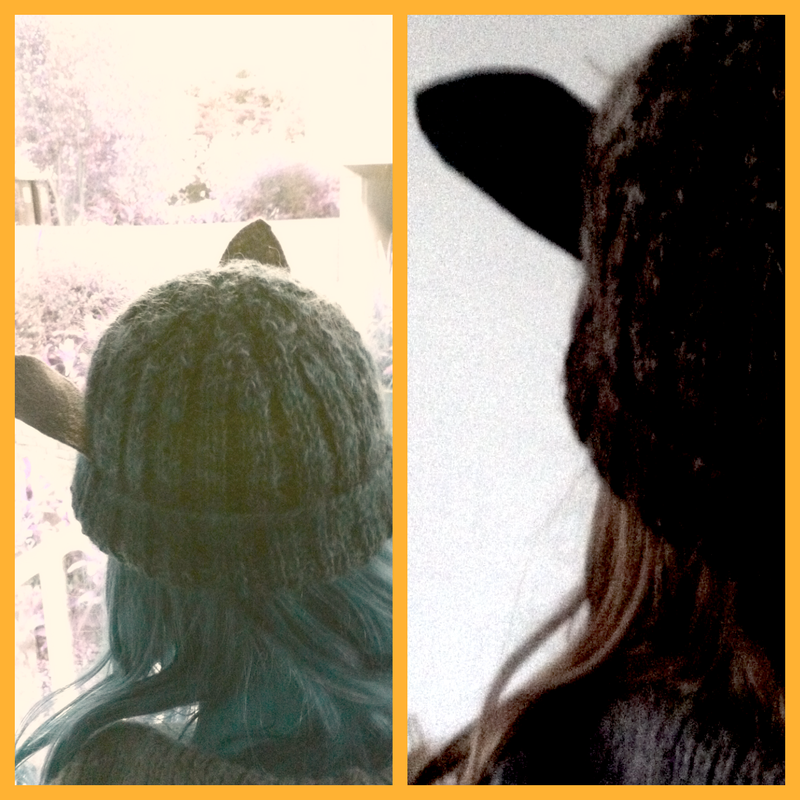 “There is no bad weather, only the wrong clothing.” Old Scandinavian saying. I used to live with a cyclist who followed weather updates quite religiously. He would check the weather app at regular intervals to see whether the storm clouds were indeed moving in, or if he should set his alarm for the 5am bike ride. For some people (and maybe some activities) a spot of rain is a deal breaker. Saskia is not one of those people. striding over the Sydney Harbour Bridge at night, clad in our raincoats, with the lights of the city casting streaky reflections on the footpath. We stepped through the deserted streets of The Rocks, stopping for a cuppa in a warm cafe on George Street before doing it all again in reverse. 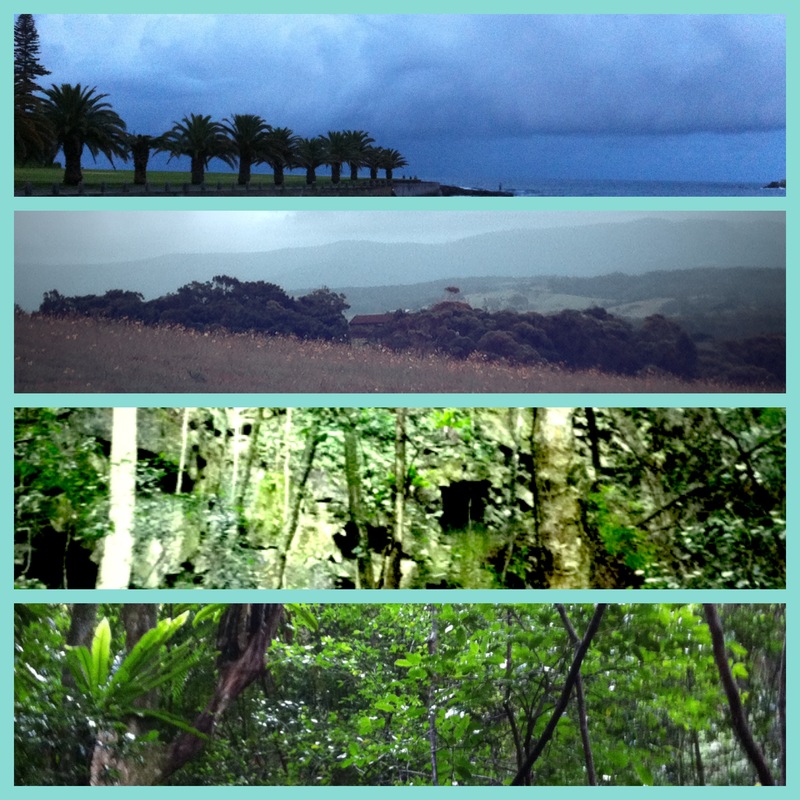 walking from Minnamurra to Bombo along a section of the Kiama Coastal Walk while storm clouds boiled above us. If we had been put off by the forecast, we wouldn’t have seen the flock of galahs that wheeled through the sky, changing from pink to grey as they circled overhead. I wouldn’t have collected the handful of smooth rounded rocks that sit so nicely in the palm of your hand and that now parade in a line across the back of my bathroom sink. We wouldn’t have happened upon the surreal basalt landscape of Bombo headland, or climbed the rock pillars lining the sea wall or sat on the edge of the rocks with the sea smashing in. having a birthday picnic at Balmoral beach, sitting cross-legged on the end of the wooden jetty at Balmoral Baths beneath a big golf umbrella. The rain kept the crowds away from our viewing platform over the bay, the boats gently clinking in the breeze as we sipped our tea poured from a thermos and ate lemon cake. So next time it rains, I’d really advise you to be like Saskia and put on a good raincoat and go out in the weather. You never know what you might discover. I come from a family of readers. My mother was a midwife and my father was a cabinet-maker. Neither of them went to university. Nevertheless, our home life was one in which books and reading were important. My sisters and I grew up in a house full of reading materials – novels, children’s books, encyclopaedias, newspapers and letters. When we were young, we were read picture books everyday. My parents still have some of those treasured books – Madeline, The Big Orange Splot and Mr Rabbit and the Lovely Present. As we grew older, we read chapter books to ourselves. My father built bookshelves in our bedrooms to house our personal libraries and we were provided with our own bedside lamps. In this way, books formed part of our private havens. My late night habit of “just one more chapter and then I’ll turn off the light” began here. In our family, reading was for pleasure. My father often read literary fiction and favoured Australian writers such as Peter Carey and David Malouf. My mother enjoyed humorous poetry and taught us many poems and rhymes. There was a particular poem called The Friendly Cow, which we would all say in unison every time we passed a dairy farm. Sharing stories and poems aloud and often knowing them by heart, was part of the discourse of our family. Books also provided storylines and ideas for games. We played at finding a “Secret Garden” and took turns being Mistress Mary, Martha and “the robin”. This was especially effective in my grandmother’s long shady garden. My mother also suggested novels to us that she had enjoyed as a child. Accordingly, I read the Billabong series, Little Women and Anne of Green Gables. These last two series, which focused on young girls who harboured ambitions of teaching and writing, perhaps affected me more than I realised at the time. I also read the Swallows and Amazon series about the adventures of a group of children sailing boats in the Lakes District in England. One day, as I borrowed one of these from the library, I was startled by a comment made by a classmate. He did not believe I really read such “thick books.” I had never been intimidated by the length of a book and was surprised to consider that others might be. To me, reading was not just something you did at school and was definitely not done only because you had to. It was the key into other worlds, other people’s heads and experiences I had never come across in my own life. I attended the local catholic primary school which I do not remember with a lot of kindness. Although I did well, school seemed tedious. Moreover, I don’t remember learning to read or any story books I read while at school. I do recall writing drills; copying the same letter endlessly on specially ruled paper. We were also drilled on our spelling using a program called “Morphographic spelling.” This was full of long convoluted words which I never reused and whose meaning we didn’t learn. The memory trick of remembering the order of the letters was more important than tying it to our own experience. School was not like books, there was no magic. After careful coaching from my mother, I was accepted into a selective public high school. I was the only one from my primary school who took up a place there, which was very daunting initially. I have a number of distinct memories from this period. One of these is of a Year 8 English assignment, where we had to write our own poem inspired by Ted Hughes’ Wind. We became very enthusiastic about the task and invested much thought and time into our efforts. This is my first memory of really having the motivation and interest to revise and fine-tune a piece of writing. Moreover, the results were spectacular! I also remember having a terrific English teacher in Year 11 called Mr B. Looking back, I realise we became so engaged because he got us thinking deeply by asking questions that took us beyond the texts themselves. English was not where I gained a lasting knowledge of Grammar however; instead it came from studying other languages. As a consequence of learning French, I was suddenly able to recognise the different parts of the English language. I had a great French teacher called Mrs P. She really taught me that language is about communication and making meaning. After school, I completed a Bachelor of Arts at university. This included two Creative writing courses where I tried my hand at poetry, playwriting and fiction. Writing workshops were highly anticipated and exciting, often inspiring awe at classmates’ efforts. These courses also cemented the idea of writing as a serious profession which we could all consider. After completing my degree, I drifted into a career in I.T. as so many people did during the Dot com boom. Work in this area was readily available and offered many travel opportunities. This was attractive after struggling to find work during the recession of the 1990s. I still wrote every day, however now the texts were informational – user guides, test cases, test plans. The aim was to be very clear, accurate and concise. I had to write to a deadline and for particular audiences. Looking back, it was a good discipline to write within such constraints. I am now the mother of two avid readers. Some of the traditions from my own childhood continue in theirs – frequent trips to the library, bedtime stories and discussions about events and characters from favourite books. One of the highlights of recent years was discovering Harry Potter alongside my children – all as first-time visitors to the world of Hogwarts. We read the first three books aloud together, my children sitting wide-eyed beside me. (I continued the journey into the later, darker books alone.) My fascination with the way my son learnt to read at school was one reason I decided to retrain as a primary teacher. When my children were born, a large box arrived on the doorstep filled with books, kernels of foam clinging to their sides. They were a present from my family’s American friend Mardi. She had also sent books to my sisters and me when we were young. Looking back, this tradition of books as presents was significant. It gave us a sense that books were special, that stories were gifts and giving books was a way of showing someone that you cared about them. Mardi had been a primary school teacher and had also set up a program to raise literacy levels in children, a passionate concern of hers. Echoes of her aims and philosophies come to me when I read with my children and also in my studies in Education. For instance, reading as a way for children to bond with important adults in their lives. Mardi was someone I really admired, and I now see that she too, influenced me in my decision to become a teacher. Looking over the history of my own literacy, I can now conclude that my family life had a greater influence over my literacy than that of my schooling. I can see that I was fortunate in having parents that supported and encouraged the habits of reading for enjoyment. This was particularly important as my early schooling was not very inspiring. I was luckier at high school and university, but the urge to read and create stories can really be traced back to my early family life. As a teacher I hope to instil a love of literature in my students – not only are reading and writing necessary skills for participation in general life, they can be the departure point into the rich world of the imagination. *This is an edited piece written a few years ago as part of my Education studies at university. You might be interested to know that Lucy, now aged ten, is currently devouring Harry Potter and the Deathly Hallows by herself. READING The Night Circus by Erin Morgenstern (recommended). WATCHING a preview of the new movie Holding the Man (recommended). MAKING a birthday present for Saskia. LISTENING to my students sing When I grow up from the musical Matilda. HAPPY ABOUT the fact that Spring is in the air. This weekend a brand new park has opened in Sydney. Right on the water. Right in the middle of the city, between the Harbour Bridge and Darling Harbour. It is land that had been used for maritime ventures for a hundred years, but has now been returned to the public after much debate, compromise and controversy. It is part of former Prime Minister Paul Keating’s grand vision for Sydney Harbour. (Remember when we had a Prime Minister who had grand visions?….) Keating insisted that rather than referencing recent history, the focus should be on a return to what the land looked like before the invasion of the Europeans. He wanted the impression of a “naturalistic” headland as would have been seen and used by the Indigenous people of the Eora Nation. So today, on its opening weekend, my sister and I jumped on a ferry and went to check it out. It was glorious summer weather even though it is officially still winter. (Sometimes we get lucky). The headland rises to a large open grassed area (aptly called Stargazer Lawn) and is terraced by meandering garden beds containing hardy indigenous plants including gum trees, grevilleas and banksias. As the terraces curve around towards Darling Harbour, the vegetation changes to rainforest plants – tree ferns, palms and Lilly Pillies. 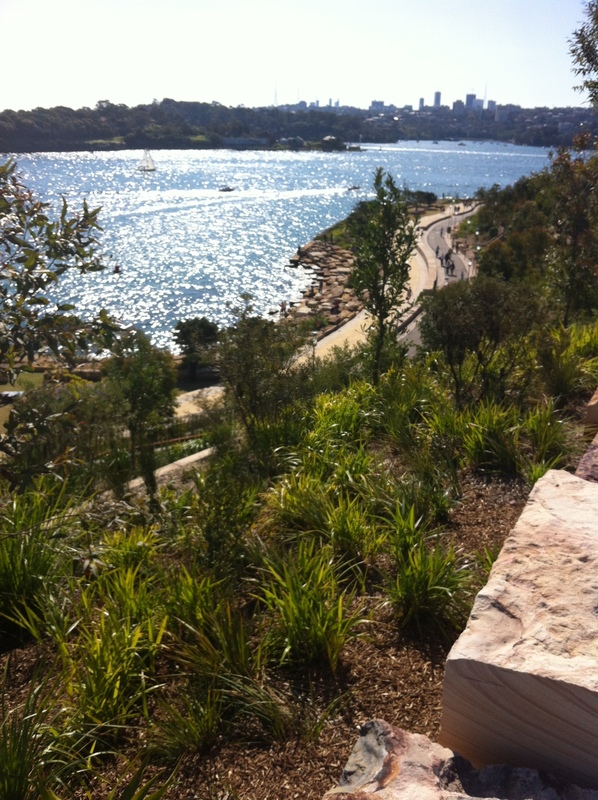 The hill-top lawns give new vistas out over the harbour, down over Balmain and the Parramatta River, and sweeping around towards North Sydney. It is quite magic. You look across to Goat Island, or Me-Mel as it was known traditionally. Me-Mel was the home of both Barangaroo, and her husband Bennelong. You can imagine her paddling across the water to the island in her canoe. The shoreline undulates around the headland like a meandering amphitheatre from which you can look out over the water. This was my favourite part. It is built using thousands of huge blocks of sandstone arranged to step down right into the water, like a giant cubist sculpture. At this point, we left the path and scrambled over the rocks, it reminded me of being at the beach exploring rock pools. The massive sandstone bricks were deliberately arranged with their topmost surfaces left rough, uneven and sometimes pitted with oyster shells. Sandstone blocks at Marrinawi Cove. We explored the paths and ended up in a small patch of shade overlooking Marrinawi Cove, where they just happened to be interviewing some of the creators of the park. We learned that the sandstone was dug out of the site itself (from what is now a car park). 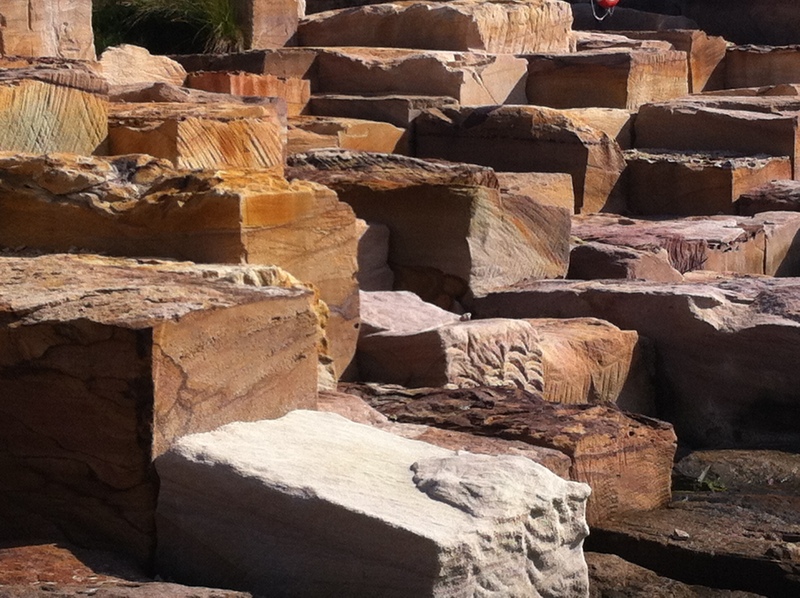 Each block was labelled and allocated to a very particular spot in the park, so the wide range of colours in the sandstone would be spread over the whole area to give a “natural” look. We heard how this “naturalistic” headland was really achieved through a great deal of planning and engineering and deliberation. Apparently, a large part of the hill on which we were sitting had been built up on a kind of giant bridge buried under the earth. As well as the car park, the headland hides an underground water system which is used to recycle water over the entire site. In the future when the plants are more established, this water will be available for other uses too. People picnicked, strolled, rode bikes and walked dogs through the park. 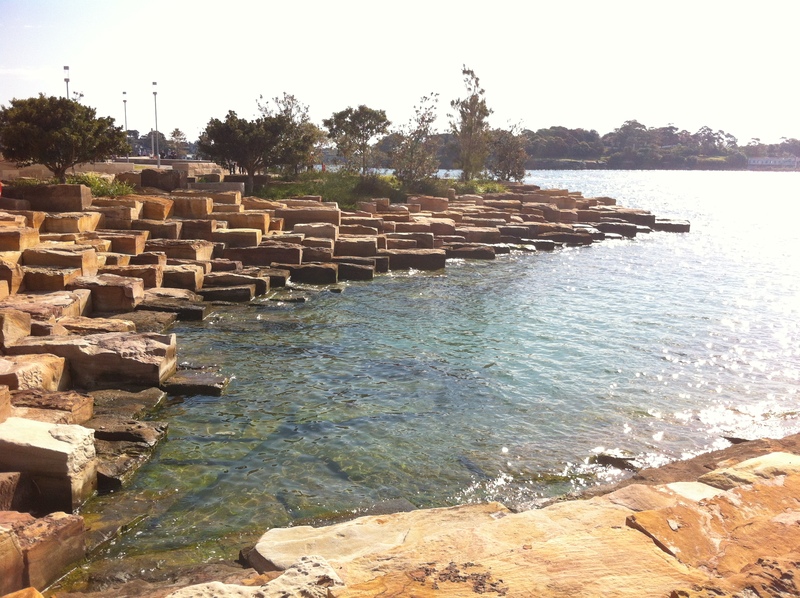 They sat contemplating the harbour from their seats of sandstone slabs. I look forward to visiting again. Some of my friends will groan when they realise that this post is about a Melina Marchetta book. 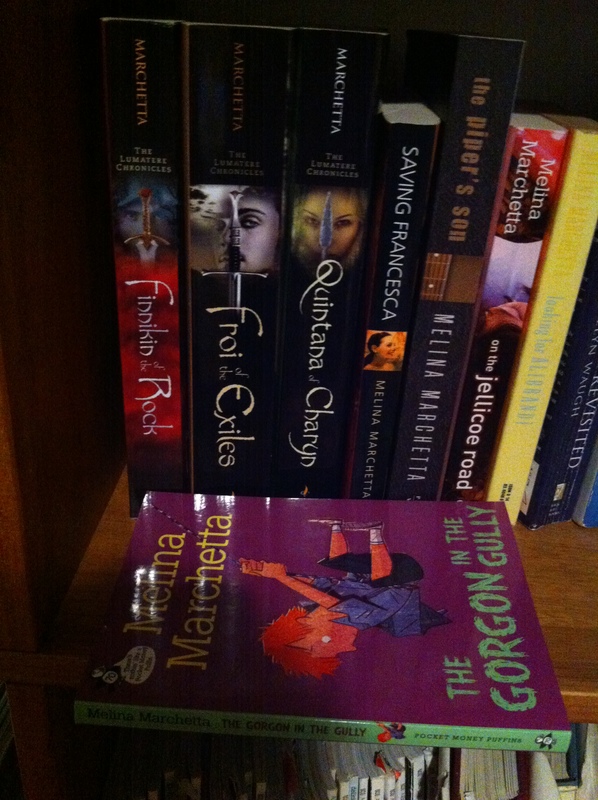 You see, in the last year, I have become something of a Marchetta fanatic, zealously preaching to anyone who will listen about how wonderful her books are. Like many people in Australia, I knew and loved Looking for Alibrandi, but didn’t realise there were more and even better offerings from this Aussie author. By chance, I read Finnikin of the Rock and then I was hooked. I read her whole canon in quick succession and started pressing copies onto family and friends. How is it that her other books are not so well known in this country? Anyway, how exciting it was to discover that as well as her Young Adult novels (whatever that means – a topic for another time), Melina Marchetta had written a book for “younger readers”. Perfect. 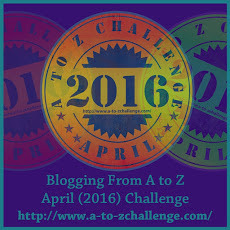 I could do my bit by introducing her to some younger readers I knew – my class. The Gorgon in the Gully tells the story of Danny Griggs, a boy in fourth grade at a school in Sydney. (“Sydney!” One of my students gasped, “That’s where we live!”) When the soccer team’s lucky ball is lost in the gully beyond the schoolyard, Danny agrees to retrieve it, despite his fear of the Gorgon rumoured to live in that very place. This is a story about an unlikely group of friends who work together to reach a seemingly unachievable goal. It is set in a primary school, which caused great joy in my class as they recognised so many familiar elements. How important it is to be able to recognise ourselves in stories. Marchetta assembles a fabulous cast of characters who soon became favourites with my class. Without fuss or fanfare, she includes characters from a range of cultural backgrounds (including an Indigenous Australian) and living in a range of family structures. It’s not an “issue” book, but by the mere inclusion of minorities, it is refreshing, but also normal. There ARE kids in my class who weren’t born in Australia, who don’t live in nuclear families, and who struggle sometimes due to problems in their family lives. For fellow Marchetta-tragics, you have probably already noticed that Danny shares the same surname as Jonah Griggs, the brooding cadet from On the Jellicoe Road. Indeed, they are brothers, and Gorgon takes place at the same time as Jellicoe, with Danny receiving advice from Jonah (when he can get mobile coverage at Jellicoe, of course). Danny and his friends come up with a highly ingenious plan to divert their teacher’s attention and allow him to escape into the gully to find the lucky soccer ball. It involves a strategically aimed meat pie thrown by Akbar the Fast Bowler (or Akbar TFB). Akbar has a signature move where he points at his own eyes with two fingers then points at someone else. My class and I practised this, and every time Akbar did it in the story, we did it too. In fact, they loved it so much that they started a new class ritual. Every morning when they arrived at school, a procession of children knocked on the classroom window to get my attention, gave me the “I’m watching you” action, waited for me to reciprocate, then ran off to play. Term 3 is half over and it’s still happening. So Melina, thanks for the fantastic stories and I hope my kids will go on to read your other books when they get a little bit older. My class has just finished examining Where the Wild Things Are by Maurice Sendak. Although it’s a short book of not many words, it is a book of big ideas which took us many sessions to explore. The plot could be described as being about a mischievous boy called Max, who after being sent to his room in disgrace by his mother, has an adventure, then decides to return home. But of course, there is much more to it than that. We started by doing a class brainstorm on a few key words. Before the children even knew which book they were going to read, they thought about “Wolves” (nocturnal, wild, predators, teeth), “Mothers” (loving, kind, cuddles, but also bossy, mean, strict) and “Night” (dark, moon, scary, sleep, dreams). You can see how interesting this is already. We noticed how the Wild Things were made up of parts of many creatures. Max himself is part human, part wolf. We made our own Wild Things by folding paper into three sections and having a different person draw the head, the body and the legs. These were given interesting names like Hipp-octo-snake or Echid-fish-bug. We examined each picture and each word and noticed many strange and unusual things. It became important to notice if Max’s eyes were open or shut. What was happening when his eyes were closed? Books like this one fill a primal need. In the real world, children are small helpless beings, forever at the mercy of giant grown-ups who make the rules and control every aspect of their lives. There is something thrilling about a story in which the child protagonist is somehow able to subvert the normal way of the world, and become an all-powerful being, exerting absolute control over all the other characters and the environment. Perhaps this is why this story remains so potent and so loved despite being over sixty years old. (In a similar vein, my class has enjoyed Roald Dahl’s Matilda). Perhaps there is also something really compelling about an angry young boy finding a means within himself to let go of some of his rage. When we looked at the last image of Max returning to his room and finding his supper, I asked why they thought he was shown with his wolf hood pushed away from his face. One of my own complex little people put up his hand. “It’s because he isn’t angry anymore,” he informed the class.